Protests in Sao Paulo, Brazil. Demotix/Andre M. Chang. All rights reserved. Why are Brazilians saying “enough is enough”? The answer depends on whom one asks. To the social movements that initiated the protests against the exorbitant bus fares in Brazil’s major cities the agenda is quite clear: a mass media highly concentrated and dominated by conservative groups, an out-of-control deadly police force, and the increasing disillusionment with a corrupt political system. However, to the white middle-class protesters the answer may be the impeachment of President Dilma Rousseff. There are real reasons for Brazilians to be angry, but mainstream media’s concerted agenda of attacking the Workers’ Party (PT) Government and its social-democratic agenda – most of the current demands such as bills for harsher punishment of public corruption, expanding the health system, and more resources to public education have been long proposed by Ms. Rousseff and blocked in the Brazilian Congress - should not be overlooked. 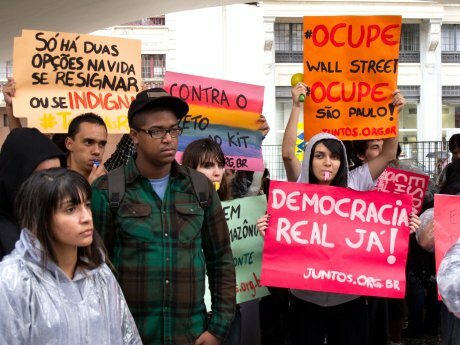 Brazilian mainstream media quickly identified the opportunity opened up by a generation of youth disappointed with politics. Media groups such as Folha de São Paulo, TV Globo, and TV Record abruptly changed the tenor of their coverage in recent days – shifting from regarding the protesters as vandals to celebrating them as heroes. This rhetorical about-face should serve as a red warning flag for Brazil’s social movements and left-wing political parties: they have failed to communicate with new political actors in a rapidly changing society. After supporting unsuccessful conservative candidates in the last three presidential elections, the mainstream media now sees this month’s display of popular anger as an opportunity to use the protests to destabilize the already weak President’s government. Contrary to the message that the mainstream media is propagating, however, the original protests were not an anti-Workers’ Party parade. Rather, they were calling for the too-centrist political party to push its social agenda further to the left. Although it has enjoyed unprecedented popular support since gaining control of the presidency in 2003, the PT has refused to carry out major reforms in strategic sectors such as the media, taxes, and the political system itself. Instead, it has established alliances with a range of right-wing politicians, including former presidents José Sarney and Fernando Collor, and Paulo Maluf, the former mayor of São Paulo who is wanted by Interpol on corruption charges. That being said and the media’s cynical appropriation of the social movement’s agenda notwithstanding, the protests bring to the surface a general frustration with the country’s political institutions - mainly the Brazilian Congress - and the lack of government response to structural problems in the huge public health care service, public education, security, and urban mobility. These frustrations are intensified by the high costs of a gift most Brazilians don’t want: the 2014 World Cup. Brazilians are fed up with the International Football Association (FIFA), for the social and political costs that the World Cup’s planning and preparations have represented for a country trying to leave behind a disturbing record of social inequalities. The first lesson to be learned from the protests, therefore, is this: if football can unite people – as FIFA President Joseph Battler stated at the opening of the Confederations Cup on June 15 in Brasilia – it can also be a tool for motivating social change. That is the case today in Brazil, where there is such clear dissonance between FIFA´s priorities and the needs of ordinary Brazilians. As banners have declared on the streets in recent days, “We don’t need football, we need hospitals and schools.” Although in the last ten years the Workers’ Party has lifted 40 million people out of poverty, expanded access to education and restructured state finances, the government cannot afford to spend billions of dollars to meet the unscrupulous demands that FIFA places upon the hosts of its events. The popular anger with FIFA’s corrupt and cynical practices seems to be bigger even than the desire to host the World Cup – an event that most Brazilians love. To protect its corporate interests, FIFA has brought the Brazilian state to its knees. The Lei da Copa (World Cup General Law), passed by the Brazilian Congress in 2012 under threat from FIFA, undermines the nation’s sovereignty, humiliates its authorities, and violates other national legislation – including the Fan Statute, Consumer Defense Code, and the Brazilian Constitution itself. One of the most polemical articles of the Lei da Copa states, “The Union shall be responsible for any damage, by act or omission, to FIFA, their respective legal representatives, employees or consultants, in accordance with art. 37, § 6, of the Constitution.” Additionally, the law grants fiscal exemptions to FIFA, and awards cash prizes to members of the 1958, 1962 and 1970 World Cup championship teams, all paid for with public funds. According to the National Court of Auditors, public expenditures on the World Cup are expected to be US$ 13.5 billion ($28 billion Brazilian Reais). The originally publicized cost of the event was US$ 7 billion. These investments are projected to attract 600,000 tourists and generate 700,000 jobs. The recently inaugurated Brasilia National Stadium is a revealing example of the World Cup’s cost overruns. The government initially planned to spend only half of the US$ 500 million that was ultimately allocated to the project in order to meet FIFA’s requirements. Likewise, the half-billion dollar Maracanã Stadium in Rio de Janeiro was not only 30% more expensive than originally planned, but the local government then tried to transfer the stadium’s operations to a private corporation for a 35-year concession – a highly contested move that has been temporarily barred by the Brazilian Federal Court of Justice. While FIFA has carried out anti-racism publicity campaigns and enacted stricter punishments against displays of racism in the stadiums, it is outside of the arenas that race continues to do its work. Brazilian cities are racially divided formations, with whites mostly living in the so-called “noble areas,” and black “favelados” primarily living on the hillsides, or far away from downtown. These racial geographies were not created by FIFA’s events, but they have been intensified by FIFA’s demands to the Brazilian government to meet the requirements for the World Cup. Since being selected to host the event, state governments from different political parties have undertaken a concerted process of military occupation of urban enclaves, exchanged military technology and urban conflict expertise with Israel, and intensified shoot-to-kill policies. In the 12 cities that will host World Cup games, the state government has carried out urban warfare against black communities to grant protection to business and security for white tourists. This includes the removal of predominantly black urban communities, police raids in the favelas around the football stadiums, and arrests of street-vendors, beggars and drug addicts. For example, in 2009, Rio de Janeiro’s governor, Sergio Cabral, began the “Shock of Order Program,” which consisted of combating disorder in Rio’s public spaces, arresting crack addicts, bearing down on street vendors, demolishing illegal constructions, and “cleaning up” historic downtown areas. The army’s invasion of favelas in 2010, broadcast live on television, inaugurated a new phase in Rio de Janeiro's pacification program, which was designed to draw a ”security line” around the favelas dominated by drug dealers and surrounding the tourist areas of the Marvelous City. Since then, pacification police units have occupied favelas around the city, expelled residents supposedly involved with criminal activities, incarcerated thousands, and killed others. Likewise, in São Paulo, the state and city governments have carried out an ambitious program of urban renewal – removing communities from strategic areas around downtown and the Itaquera stadium, and violently repressing popular protests, while the incarceration and police killing rates increase. Known as the Brazilian California, the state of São Paulo has as many as 203,000 people behind bars, which represents 35% of the Brazilian prison population, according to the Brazilian Ministry of Justice. The state is governed by Geraldo Alckmin, a political ally of former president Fernando Henrique Cardoso. Of course, the majority of those incarcerated are poor urban youth who come from the more than 600 favelas found throughout the metropolis. Although the mundane assassination of black youth by the police has not provoked as much public outcry as it does when the victims are white, urban black youth are overrepresented in the statistics of killings by the police. According to the State Secretariat of Public Safety, in 2012 the police killed 331 people in the city of São Paulo alone. According to the newspaper Diario de S. Paulo, 60% of those killed by the police in 2012 were blacks. As disturbing as it sounds, after a wave of massacres of “suspects” by the Military Police in November 2012, governor Geraldo Alckmin justified the massacres by arguing that those killed were involved in a criminal organization. The urban conflicts provoked by the preparations for the upcoming sports mega-events have caused the United Nations Special Rapporteur on Adequate Housing, Raquel Rolnik, to challenge the Brazilian government about the serious violations of human rights committed by the state. Rolnik has specifically criticized the inadequate financial compensations for the displaced, lack of dialogue with the affected communities, and police brutality. The protests against high bus fares throughout Brazil made local and state governments drop the fares. But as the world’s eyes are on Brazil, organized social movements will continue to come out to the streets until the games start in 2014. Their agenda is clear: to unveil Brazil’s enduring racial injustices, to denounce the chaotic and pricy Brazilian metropolis, to refuse FIFA’s assault on the country’s sovereignty, to demand the democratization of mass media, and to push the state toward a socialist agenda. In this sense, the demonstrations may be an encouraging sign for Brazilian democracy; by exposing the link between football and politics, they expand the horizons of politics in a creative and incisive way. A ghost, however, haunts Brazil. As in the days before the 1964 military coup, mainstream mass-media’s anti-PT rhetoric and the middle-class frustration with the political system is an explosive combination that makes one wonder if the Brazilian spring is in fact a dark Chillean-type winter. President Rousseff’s proposal for major political reform through a constituent assembly may mean a long-demanded return of the Workers Party to its popular and original project. In fact, her political survival depends on her ability to dialogue with the social movements, to accommodate the aspirations of an angry middle class, and to bring about the structural changes once promised by her party. Otherwise, the conservative political groups will be the ones profiting from the political instability in part produced precisely by their longstanding assault on the Brazilian state. Any political analysis of what comes next should consider the amazing and disturbing nature of the protests. Well, this is Brazil. To use Levi Strauss’ expression, we are in the "Triste Tropiques".